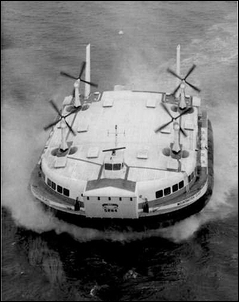 Following the success of the Saunders Roe SR.N1 experimental hovercraft design (see The Incredible Hovering Craft, Part 1), the company decided in late 1959 to build the first commercial passenger-carrying hovercraft. To be called the SR.N2, it would carry 59 passengers. It was finished in 1962, but was the only one of its type built. By the end of 1963, Saunders Roe had been commissioned by the UK Ministry of Technology to build a larger version of the SR.N2 for military applications. The SR.N3, as it was logically called, could carry 92 fully equipped soldiers at speeds over 70 knots. Alternatively, it could also carry vehicles such as jeeps and even medium sized trucks. Again, only one of the type was built. However, the next class of hovercraft, the SR.N5 and the 10-feet longer SR.N6, was built in multiple units. The SR.N5 was almost 40 feet long and 23 feet wide, and could carry 18 passengers at up to 66 knots. Fourteen SR.N5 craft were built, starting in 1964. 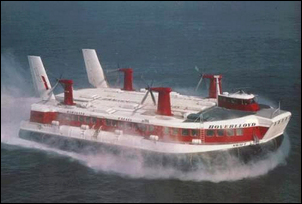 The longer SR.N6 was constructed in even larger numbers – by 1982, 69 of the hovercraft had been built. 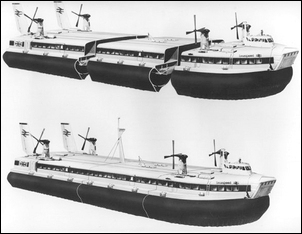 But it was the missing model in that sequence – the SR.N4 – which was the really significant hovercraft. 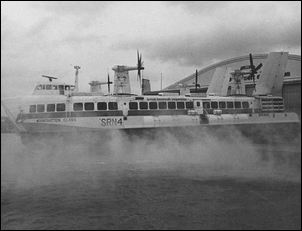 The SR.N4 – also known as the Mountbatten class – was at that time the largest hovercraft ever made. The first 165-ton Mountbatten class SR.N4 was launched at East Cowes at 14.07 hours on Sunday 4th February, 1968. The craft cost £1.75 million and was fitted with a 2.5 metre high skirt, which was expected to cope with most conditions in the Channel. It underwent 2 hours 30 minutes of trials, covering a distance of 20 miles and reaching speeds approaching 50 knots - this in winds gusting to force 6. 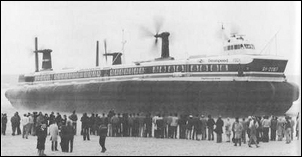 The world's first hovercraft car ferry then made its maiden flight from Dover to Boulogne on 11th June, crossing the Channel in 35 minutes. Further test runs were undertaken before the SR.N4 returned to East Cowes for final completion. The prototype SR.N4, now named Princess Margaret, entered commercial service on the 26 mile route between Dover (Eastern Docks) and Boulogne at 10.25 on 1st August, 1968, following two days of press and VIP trips. This route was chosen so that customers could easily be switched to British Rail's ship ferry service if anything went wrong. It was a wise precaution; only three days later the craft was out of service with a damaged skirt and a small oil leak. It returned to service on 8th August, but the two month trial period was marked by a lack of reliability. From 15th August to 30th September, six daily return flights were advertised, the first leaving Dover at 08.20 and then every two hours. Wednesday was half-day - with three round trips followed by a period of maintenance. Fares were £3.10s.0d (£3.50) single with a day excursion for £3.00. Even the moderate wave conditions - to which the Board of Trade's initial licence limited the SR.N4 - played havoc with the 2.5 metre skirt. It emerged later that a chain linking the inner flaps of the segmented skirt for extra strength was not up to the actual stresses received and when it broke, the loose ends slashed the skirt fabric to ribbons. 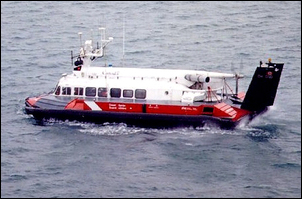 Changing skirt sections was a lengthy operation and Seaspeed (the company operating the craft) had maintenance facilities only at Dover - and no craft in reserve. During November, the Princess Margaret was withdrawn and returned to Cowes for the fitting of the new Mk II skirt which had been developed, as well as some fairly substantial alterations in certain specifications. On 10th December 1968, the second SR.N4 - later named Swift - was rolled out on to the pad at East Cowes. It was the first craft with the new Mk II skirt, which provided both a smoother ride and more protection to the bow. This SR.N4 underwent trials at the Pegwell Bay terminal on 17th January, 1969. Hoverlloyd's new Pegwell Bay service commenced with the SR.N4 Swift on 2nd April. Exactly one month later, the Duke of Edinburgh officially opened the £1 million terminal and flew the Swift across the Goodwin Sands himself. Hoverlloyd's second SR.N4, Sure was named by Mrs. Soames, wife of the British Ambassador to Paris, on 3rd June. 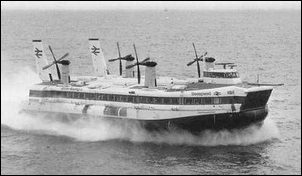 The third SR.N4 to be built, The Princess Anne, started operations at Dover on 8th August 1969. In 1973three SR.N4s were to be converted to Mk II specification - the two inner passenger cabins on the car deck were removed (to allow greater space for vehicles) and main passenger deck was extended outwards to edge of the craft's raft superstructure. Capacity was increased from 250 to 276 passengers and 30 to 36 cars. The first converted craft, Swift, was flown to East Cowes for conversion in September and was ready by January 1973. The other craft followed thereafter through to 1974. 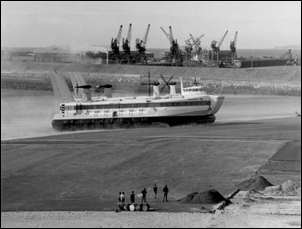 By the end of 1974, nearly 1½ million people a year were being carried across the Channel by hovercraft, representing 30 per cent of the passenger traffic. The percentage of car traffic carried by hovercraft was growing even faster. In 1976 Government approval was given for the stretching of two SR.N4 craft - The Princess Margaret and The Princess Anne - to Mk III status, the first craft due to be ready for the summer of 1977. This lengthening by 55ft increased passenger capacity from 254 to 424 and cars from 30 to 54. With the four Rolls Royce Marine Proteus gas-turbines being uprated to 3,800 shaft hp, larger propellers with a diameter of 21ft (6.4m) were fitted and weight was increased from 190 to 265 tons. The skirt was also deepened to 7.5 metres, enabling the craft to cope with 4-metre waves in gale Force 9 conditions. The stretched twins required a new hoverport within Dover Harbour. The next SR.N4 - The Prince of Wales - entered service between Ramsgate and Calais on 18th June 1977. 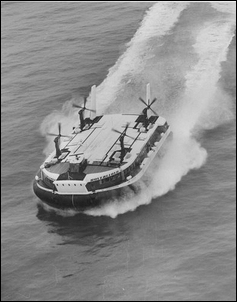 The craft had more than 120 modifications and improvements on the previous hovercraft, the main difference being the larger, new type of control cabin. It was the first craft built as a Mk II from the outset. The stretched SR.N4 (now designated Mk III or Super 4), The Princess Anne was re-launched at Cowes on 6th April. Civil Aviation Authority ruling was then changed to allow the SR.N4s to operate in up to 50-knot winds with waves of up to 3.5 metres height (previously 35 knots and 2.5 metre waves), the result of which was that fewer services were lost due to poor weather conditions. But the two companies (Seaspeed and Hoverlloyd) that were running the huge craft were losing money, and in 1981 they merged to form Hoverspeed. Hoverspeed carried 2.5 million passengers and 400,000 cars in the first six months - with 35 per cent fewer flights and with 250 less staff. By the year's end, the company had a 21 per cent market share of cross-Channel traffic. 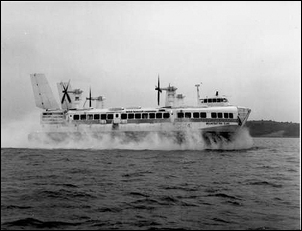 However, competition from wave-piercing catamaran ferries was too strong, and by the early-Nineties only two hovercraft – The Princess Margaret and The Princess Anne - remained in operation. In 1995 ThePrincess Anne set a new cross-Channel record of just 22 minutes. Her Master, Captain Nick Dunn said, "The conditions were just right, calm seas, excellent visibility and not much traffic in the shipping lanes. 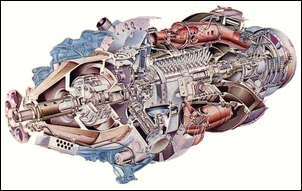 I just opened up the throttles and the craft's four Rolls Royce turbines did the rest." The craft had undergone some preparation for the attempt and the load that day was light. 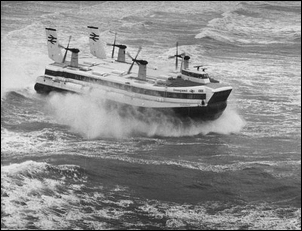 The run was made on the return flight to Dover, with the craft having been parked at Calais facing the sea. All that had to be done was to lift off and push the throttles to full power, heading in a straight line for Dover. The usual speed limits within the harbour at Dover were waived, and the craft was brought towards the pad at full power. As the tide was out, the slope of the ramp to the pad was used to brake the craft, together with a generous amount of reverse pitch on the propellers. The craft was then unceremoniously dumped on the pad to make the record time. In October, 2000 the two hovercraft made their last channel crossings, and were subsequently put up for sale at £7 million for the pair. The 32-year reign of the giant craft was over.